Dwarven Armored Mudcrab is a Creation that adds the eponymous Dwarven Armored Mudcrab. It was released on November 30, 2017 for 50 CC Credits, although it has been offered for free since its release. This Creation adds the quest My Pet Mudcrab, which is automatically added to your journal upon installation. 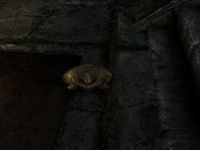 The quest directs you to Understone Keep in Markarth to purchase the Dwarven Armored Mudcrab from Calcelmo. This page was last modified on 9 December 2018, at 11:32.